Cardiovascular disease (CVD) is the leading cause of morbidity and mortality globally. Influenza is one of the leading infectious causes of morbidity and mortality globally, and evidence is accumulating that it can precipitate acute myocardial infarction (AMI). This is thought to be due to a range of factors including inflammatory release of cytokines, disruption of atherosclerotic plaques and thrombogenesis, which may acutely occlude a coronary artery. There is a large body of observational and clinical trial evidence that shows that influenza vaccine protects against AMI. Estimates of the efficacy of influenza vaccine in preventing AMI range from 15% to 45%. This is a similar range of efficacy compared with the accepted routine coronary prevention measures such as smoking cessation (32–43%), statins (19–30%) and antihypertensive therapy (17–25%). Influenza vaccine should be considered as an integral part of CVD management and prevention. While it is recommended in many guidelines for patients with CVD, rates of vaccination in risk groups aged <65 years are very low, in the range of 30%. The incorporation of vaccination into routine CVD prevention in patient care requires a clinical practice paradigm change. In 2008, cardiovascular disease (CVD) overtook communicable diseases for the first time to become the leading cause of mortality in the world, now causing approximately 13% of all deaths globally.1 Given the high global burden of coronary heart disease (CHD), prevention through identifying and mitigating risk factors is a priority. Cigarette smoking, elevated serum cholesterol levels and high blood pressure are major risk factors for developing CHD and significant predictors of death, and are therefore accepted targets for preventive strategies.2 When considering attributable deaths, raised blood pressure is categorised as the leading risk factor followed by tobacco use while high serum cholesterol is ranked sixth.3 Behavioural interventions such as smoking cessation, dietary and lifestyle changes, use of statins and antihypertensive drugs are accepted public health strategies for reducing the burden of CHD.4 Could influenza vaccine be an additional strategy to reduce CHD burden? Atherosclerosis is an inflammatory response culminating in a plaque comprised of a core rich in lipids, pro-inflammatory cells and cytokines, and a fibrous cap. It is thought that influenza acts by many mechanisms, including inflammatory release of cytokines that causes a pro-thrombotic state, local disruption of coronary plaques, as well as physiological effects such as hypoxia and tachycardia, to cause acute obstruction of coronary arteries that may be otherwise subcritically stenosed.13 Other mechanisms include sympathetic activation with subsequent effects on vascular tone with vasoconstriction; thrombogenesis through the nonspecific pro-coagulant and thrombophilic effects of inflammation; epithelial dysfunction; and inadequate coronary artery blood flow through increased metabolic demand with fever and tachycardia, reduced oxygen saturation and hypotension with secondary vasoconstriction.14 Further, influenza has been shown to produce direct effects on the heart. Histopathological and molecular studies on influenza-infected mice have shown that the virus can be isolated from heart tissue and that its presence leads to local inflammatory changes.15 The multiple mechanisms by which influenza may precipitate AMI are shown in figure 1. 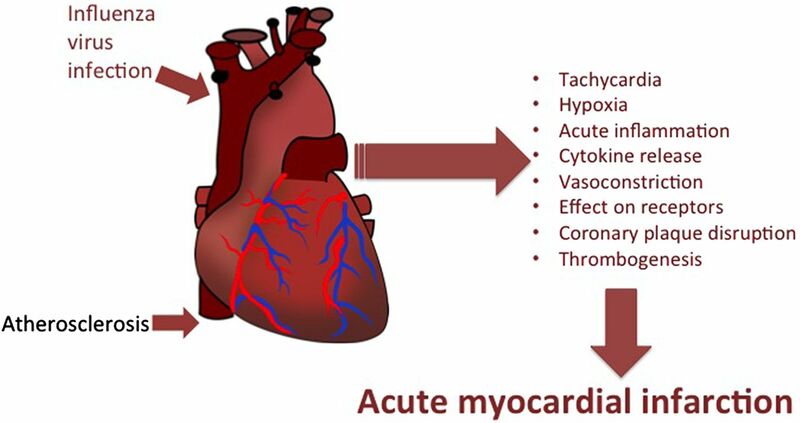 Mechanisms by which influenza infection may precipitate acute myocardial infarction. If influenza vaccine protects against AMI, the mechanism is through preventing influenza, thereby preventing the possibility of AMI triggered by the mechanisms discussed above. An additional putative molecular mechanism for the protective effect of vaccination is that vaccine-induced antibody cross-reacts with a human bradykinin receptor.22 It is postulated that this interaction could lead to increased levels of nitric oxide, which increases the efficiency of myocardial oxygen use, as well as leading to increased blood flow through vasodilation and possible angiogenesis. Does influenza vaccine have a place in routine coronary prevention? Despite the large body of evidence supporting a role for influenza vaccine in coronary prevention, rates of influenza vaccination in patients with heart diseases are low,44 and vaccination is not a priority among physicians. A significant proportion of healthcare budgets is spent on the acute treatment of AMI and the long-term management of CHD. Costs per year of life saved range from US$4350 for smoking cessation programmes to US$142–760 for statin use in under 65 year olds.45 ,46 Further gains in prevention of CHD would therefore likely be cost-effective, especially if using a low-cost strategy such as influenza vaccination. Influenza vaccination is a relatively cheap, safe and evidence-based public health measure that is underused in at-risk populations currently. Influenza vaccination has been shown to be cost-effective in preventing influenza-like illnesses and hospitalisation for pneumonia and influenza, without any consideration of its efficacy in the prevention of AMI.47 It is therefore likely that influenza vaccine could be highly cost-effective in the prevention of AMI particularly for high-risk people. Table 1 summarises the range of efficacy of accepted coronary interventions compared with influenza vaccination and highlights the potential gains of including vaccination in routine prevention of CHD. A well-powered RCT of influenza vaccine in AMI prevention would add to the available evidence.48 However, there is already compelling evidence that influenza vaccine should be considered as an integral part of CHD management and prevention. While it is recommended in many guidelines for patients with coronary artery disease, rates of vaccination in risk groups aged <65 years are low.49 In addition, this recommendation is seen as one that aims to prevent influenza, rather than to reduce the risk of AMI. A paradigm change may be required to encourage clinicians to see influenza vaccine as a cheap, safe and effective additional prevention strategy for patients with CHD. World Health Organization (WHO). Cardiovascular diseases (CVDs). http://www.who.int/mediacentre/factsheets/fs317/en/ (accessed 4 Apr 2016).
. Hypertension, blood lipids, and cigarette smoking as co-risk factors for coronary heart disease. Ann N Y Acad Sci 1978;304:128–39. World Health Organization (WHO). Global status report on noncommunicable diseases 2010. Description of the global burden of NCDs, their risk factors and determinants. 2011. http://www.who.int/nmh/publications/ncd_report_chapter1.pdf?ua=1 (accessed Jan 2015). World Health Organization (WHO). Prevention of Cardiovascular Disease Guidelines for assessment and management of cardiovascular risk. 2007. http://www.who.int/cardiovascular_diseases/guidelines/Full%20text.pdf (accessed Jan 2016).
. Effects of an angiotensin-converting-enzyme inhibitor, ramipril, on cardiovascular events in high-risk patients. The Heart Outcomes Prevention Evaluation Study Investigators. N Engl J Med 2000;342:145–53.
. Insight into ACE inhibition in the prevention of cardiac events in stable coronary artery disease: the EUROPA trial. Expert Rev Cardiovasc Ther 2007;5:1037–46. Scandinavian Simvastatin Survival Study Group. Randomised trial of cholesterol lowering in 4444 patients with coronary heart disease: the Scandinavian Simvastatin Survival Study (4S). Lancet 1994;344:1383–9.
. The effect of pravastatin on coronary events after myocardial infarction in patients with average cholesterol levels. Cholesterol and Recurrent Events Trial investigators. N Engl J Med 1996;335:1001–9.
. Factors contributing to suboptimal vaccination against influenza: results of a nationwide telephone survey of persons with cardiovascular disease. Tex Heart Inst J 2009;36:546. AIHW. Australian Institute of Health and Welfare 2011. 2009 Adult Vaccination Survey: summary results. Cat. no. PHE 135. Canberra. http://www.aihw.gov.au/publication-detail/?id=10737418409 (accessed Apr 2016). Contributors CRM: conceived study idea, wrote and revised the manuscript. AM: conducting literature review and drafting of manuscript. AMM: contributed to revision and submission of manuscript. MB: contributed to drafting of manuscript. Competing interests CRM has received in-kind support and funding for investigator-driven research from GlaxoSmithKline, Pfizer, Merck and bioCSL, and has sat on advisory boards for Merck, GlaxoSmithKline and Pfizer.